Sarkhan Vol has been on a strange journey, and his search for understanding is almost at an end. He traveled back through time, changed the past, and returned to a present transformed by his action. He has encountered old enemies and old friends, and none of them remember him. He has searched for Narset, whose sacrifice enabled him to change the past, and found her nowhere on Tarkir. 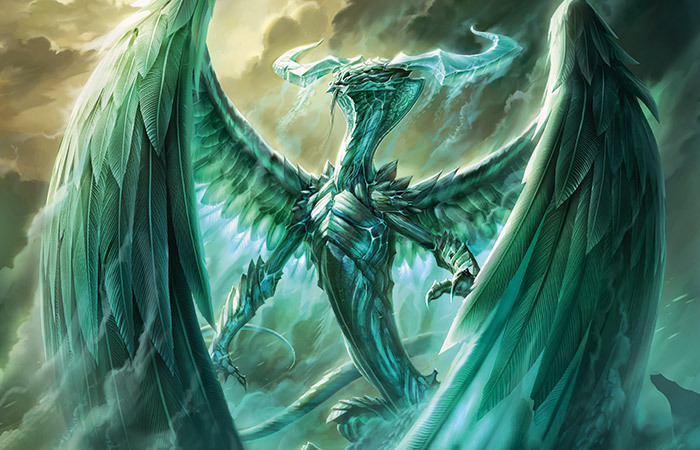 Now, he must find the only other being in existence who may be able to help him understand: Ugin, the Spirit Dragon, whom he left slumbering in a hedron cocoon over a thousand years ago. 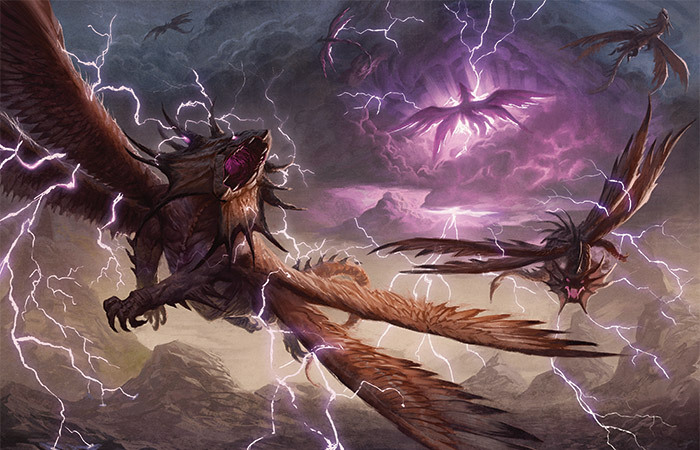 Sarkhan's wings stretched in glorious flight, soaring high above the scrub and steppe of Tarkir. In dragon form he could smell every dragon within miles, pick out details invisible to his human eyes, and sense the presence of thermal updrafts that carried him higher into the sky. In dragon form he sometimes wondered whether he had ever been human at all, and why he would ever want to be. Zurgo was alive, but changed. Sarkhan's hated enemy was dead—more than dead, better and worse, beyond redemption or revenge. That Zurgo was erased, replaced by a stooped creature who followed a dragon and rang a bell. Ankle Shanker was alive, but with a different name, a different life. She had lived instead of died, but she did not know him. 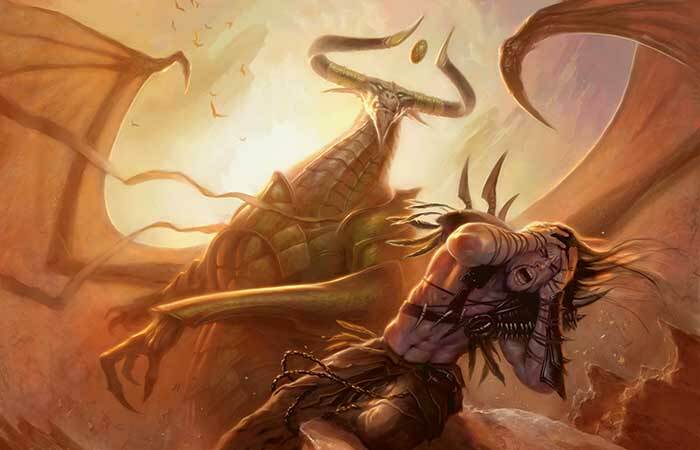 Ugin was alive, but dormant, locked away by Sarkhan's own actions. His life force still pulsed at the heart of a hedron prison, sustaining the storms that birthed the dragons. The magnificent dragon elders of the old era seemed to have lived as well, risen from glorious beasts to holders of the reins of power. Everyone lived, it seemed, save two. Sarkhan. And Narset. Where was she? Where was he? What was he now, here on the other side of time's great river? Ugin would know. Ugin had to know. Ahead of him, many miles ahead—near the canyon where Ugin lay, he thought—a bolt of blue-white light careened upward into the sky. It soared gleefully, shining like a second sun, before descending again, and Sarkhan could not see where it landed. Could it be? Ugin…awake? Had someone freed him? Had he freed himself? An ape's instincts, deeply buried, urged him to hurry forward toward Ugin's canyon, to rush, to run. But in the sky, a straight line wasn't the shortest route, and the intervening air was far from empty. Dragon-mind knew, and he had finally learned to listen to it. He wheeled around, letting the thermal take him higher. From that height, one long glide would take him to the canyon, and the truth. The canyon came into view as the sun reached its zenith. Blind to the sky above him, Sarkhan didn't see his attacker until it was upon him. A ghostly dragon, trailing blue-white mist, dove toward him from above, veering off at the last moment. A wave of heat washed over him, fire without flame. Ugin! The blast of heat hardly singed his scaled skin and the ghost-dragon never touched him physically. It hovered a few body-lengths away, serene but menacing. It had no scent at all. Sarkhan growled, somewhere between the noise an angry tiger makes and a clipped Draconic "Get out of my way." He breathed a bright blast of flame to punctuate his point and kept flying. Soon the spirit was joined by others. Sarkhan sped toward the canyon, harried by half a dozen of the ghostly creatures, outracing the sheer fire of their breath. Then, just as suddenly, they turned away, plunging into cloud banks, their translucent bodies disappearing into the mist. Within moments he could see no trace of them. He flew out over the canyon, looking for any sign of the ghostly dragons. The great hedron structure he had seen when he arrived had crumbled in on itself, reduced to pieces no larger than the one he had brought with him from the Eye. The base of the canyon was filled with fine dust and rune-etched rubble. No corpse, no bones. His draconic heart beat harder. Ugin lives. Sarkhan transformed as he dropped, landing lightly on the field of hedron rubble with human feet as his wings shrank and folded away. There, at the end of the canyon, a luminous shape towered, wings outstretched. 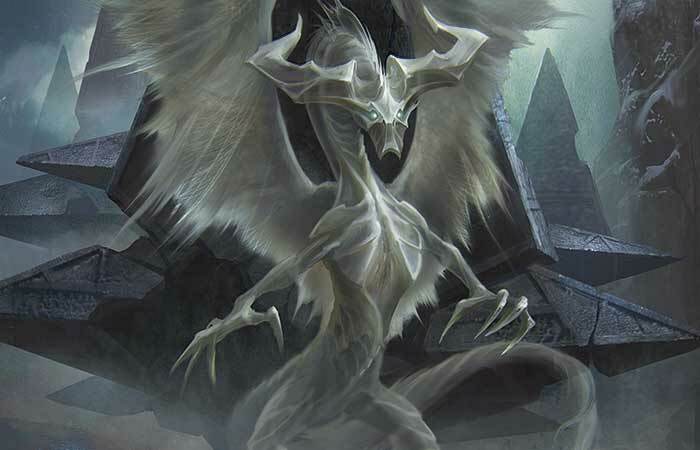 Ugin was facing away from Sarkhan, toward the canyon wall, ringed by more spirit guardians. Projected on the rock wall before him were images from all over Tarkir. The sleek, graceful shapes of Ojutai's dragons soared among the towering monasteries of his clan. A horde of savage warriors rode across the steppe, following the lightning-blur of the dragon Kolaghan. A thick-bodied dragon lounged in a dank palace, covered in jewelry and waited on by attendants. 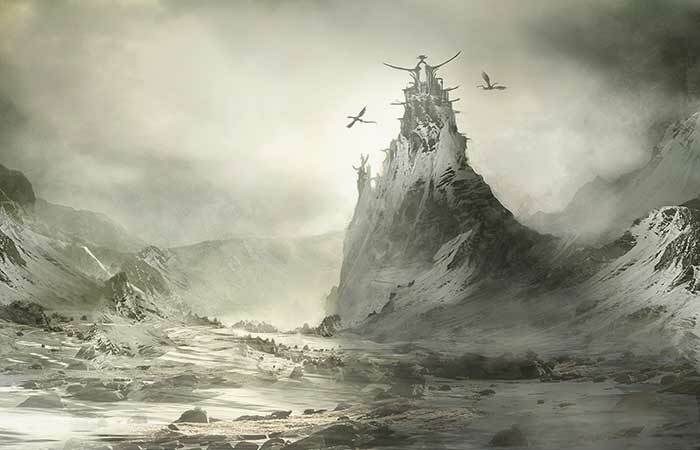 The antlered dragons Sarkhan had seen in Tarkir's past swooped low over bare and steaming mountains. Armored humanoids marched to war beneath the watchful gaze of regal, barrel-chested dragons. There was even an image of Sarkhan himself, standing in the canyon. Ugin turned, and his ranks of spirit guardians parted. He was radiant, luminous, the idea of a dragon cast in flesh and mist. "Forgive my sentries," said Ugin. "They are overzealous. I called them off as soon as I became aware of you." "Yes and no," he said. "I know what you did. I owe you thanks. And you owe me an explanation." "Great Ugin…" he said, "I came here hoping you could explain all this to me. What could I know that you do not? What questions can I possibly answer?" "I've been asleep for a thousand years," said Ugin. "You may be the only one who truly understands what's happened here. Who are you? What has happened to my world? How did this—" He opened his hand, and a shard of hedron-stone rose from the rubble to float above his palm. Not a shard—the shard, the one Sarkhan had taken from the Eye of Ugin, intact after all this time. "—travel backward through time, to arrive here over a thousand years ago?" "Then you already know what happened." "Not at all," replied Ugin. "I'm applying logic." The shard pulsed. "This came from the Eye of Ugin on Zendikar. This particular stone came from the inner chamber of the Eye, and could only be removed if the Eye had opened. And if that had happened prior to my…defeat, I would have known about it instantly. I know of no force in the Multiverse that could have prevented that. Thus, it must have happened later." Ugin drew himself up to his full height and glared forty feet down at Sarkhan. "Yet my questions remain," he said. "Who are you, Planeswalker? And how did this stone come into your possession?" "My name is Sarkhan Vol." Vol was forgotten, Sarkhan forbidden, but there could be no question, not now. That was his name. "Sarkhan," said Ugin, with a hint of amusement. Great khan. He gestured to the images on the canyon wall, encompassing all of Tarkir. "They bow to you?" "…No," said Sarkhan. "But I bow to no one." 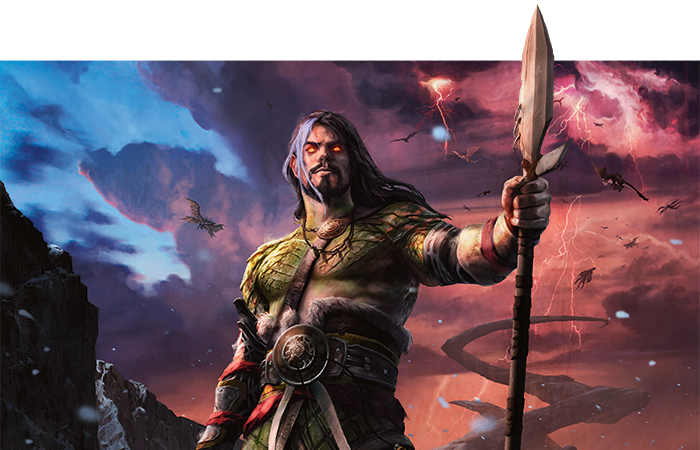 "I am from Tarkir," said Sarkhan, "but my Tarkir was a tomb—a graveyard for dragons, hunted and killed by the ancient khans. You were dead, Ugin. I saw your bones, in this very canyon." "You spoke to me," said Sarkhan. "Your spirit…spoke to me. Whispered to me of the glory of dragons. Told me that everything I suspected of this world—the decadence, the wrongness, the lack—was real. I did not know then that you were a Planeswalker. I knew only that you were a ghost. My own Planeswalker spark ignited in a rush of flame. I left Tarkir, and your voice fell silent. I found dragons, great beasts deserving of my reverence—not least because they did not know or care that they had it. Then…then I found one who welcomed it, and I foolishly gave myself to his cause. He sent me to the Eye." "You must understand," said Sarkhan, "I was not in my right mind. He was not what I thought he was, and it broke me, bent me to his will." "…Nicol Bolas," said Sarkhan miserably. Ugin raised a hand, and a sphere of glittering force sprang into being around Sarkhan. He pushed against it, but it was smooth and warm and utterly unyielding. The runes on Ugin's neck glowed brightly. "Bolas sent you to the Eye?" said Ugin. "Why?" 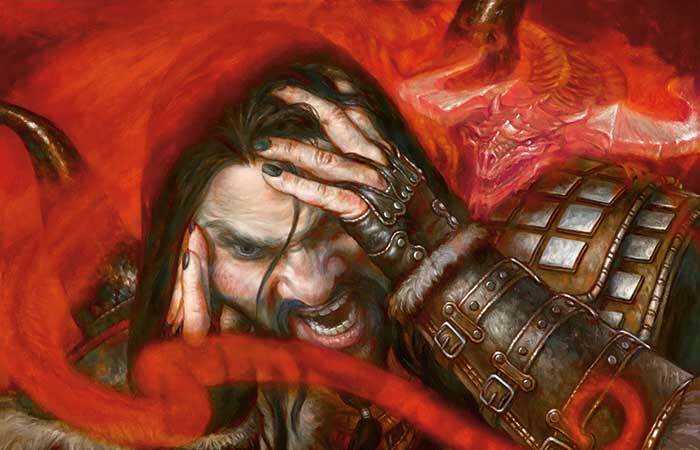 "He wanted…" Sarkhan faltered, sorting through memories twisted by madness. "He wanted it opened, the devourers released. He never told me why." "If he engineered the Eldrazi's release, he is far less cautious than I remember him." "He is obsessed with power," said Sarkhan. "He was once like a god, so he told me—but no longer. He wants that power back." "And you?" asked Ugin. "What do you want, Sarkhan Vol?" "To be free of him forever," said Sarkhan. "To make him pay, someday, for what he did to me. And to you." Ugin waved one clawed hand, and the sphere of force vanished. "So you journeyed to the Eye. There were others?" "Yes," said Sarkhan. "A pyromancer, and a mind mage. Both Planeswalkers. We fought. The pyromancer bested me with…" Understanding dawned. "With your own fire, Ugin. Somehow she knew." "Interesting," said Ugin. "Yet you lived." "They had no great desire to fight me. As soon as I was incapacitated, they fled. When I awoke, I heard your voice again. The Eye was open. I took the hedron shard back to Bolas, and told him you had spoken to me. He told me he had killed you, said something about a…a failsafe. And then he dismissed me." "Here, but not here," said Sarkhan. "I returned to my Tarkir, a Tarkir of khans and dragon bones. Your voice grew all the stronger, urging me to come to this canyon. I arrived at the canyon…with the help of a friend. Your death created some kind of…vortex in time, linking that moment to the present. When I stepped through I traveled back, before the dragons died, and tipped the scales of history. Then I found myself here, truly here, in a world transformed by my own actions." "Do you know what happened after I fell? I have had no time to study history." "Some," said Sarkhan. "The dragon tempests never ceased. Dragon-kind never died out. The khans fell. And in their place rose five elder dragons. The dragonlords claimed their rightful place in command of the world. Where once the clans fought dragons, now the dragons and the clans are one." Ugin turned to the canyon wall, watching the scenes of dragons and humanoids fighting together. Sarkhan scowled. Ugin had been his guide, his confidant…the only person who believed he could change the world. Ugin had known. But this Ugin seemed anything but all-knowing. "I have answered your questions," said Sarkhan. "Will you answer mine?" Ugin turned back to Sarkhan and nodded. "Dying, speaking to me, sending me back…" said Sarkhan. "You truly remember none of these things?" "The last thing I remember," said Ugin, "is you and your hedron shard, after Bolas cast me down. Then I slumbered. Time passed, but how much I could not say. I slept…and I healed. An ally of mine, a vampire and a Planeswalker, woke me up and spoke to me of 'foolishness at the Eye.' He meant you and the other two, though I'm not sure he knew that. Sorin Markov—do you know him?" Sarkhan shook his head. Confusion reigned; the companion in his head had not been Ugin…or not this Ugin. "Who spoke to me, if not you?" asked Sarkhan. "The friend who helped me get here—she died in the helping. Where is she now? Who was she? Who is she? A whole world has gone missing on my account, Ugin. And though I had no love for it, it was my home. What of that Tarkir?" "It is gone," said Ugin. "She is gone. Not only gone—the world you remember never existed and its people met very different fates. And what spoke to you at the Eye was the ghost of someone who never died. A ghost you brought there with you, most likely. Or perhaps only a voice." "Different fates…" said Sarkhan. "I have met people who looked like those I knew, both friends and enemies. But they did not know me. As though I were never born. But how can that be? If I was never born, then where did I come from? Who went to the Eye? Who saved you?" "You did," said Ugin. "The Eye is in your past, in this hedron shard's past. You went there, traveled to Tarkir's past, and used the shard to save me. It must have happened, or the change itself would not have been possible. Whatever circumstance arose when I died—whatever my spirit did that allowed you to travel back through time—it only affected Tarkir. Which means that you, Sarkhan Vol, stepped fully formed out of a shadow, a place that never existed." "Then in this world's history, I was never born," said Sarkhan. Understanding dawned. "I sprang from the sky one day…like a dragon." "I suppose so," said Ugin. "So I'm a curiosity now," said Sarkhan, smiling. "An orphan of time. Whether I was haunted or only mad, the voice that guided me has fallen silent. My mind is my own, and Tarkir is the world I always longed for." "You say my friend is gone. Ojutai's monks said the same. I say she lives again, and I will find her." He focused, drawing mana to himself and awakening the dragon within. It was easier now. It grew easier every time. A dragon's shape spilled forth. "Thank you," he said, before his human mouth slipped away, and launched himself into the sky. The canyon fell away and the icy wastes spread out beneath him. The Narset he knew had sought knowledge above all else. And that quest had brought her, ultimately, here—to Ugin's canyon. If this world's Narset was exiled, branded a heretic…where else would she be? He ranged over the valley at top speed—riding thermals up, gliding down—sharp eyes watching for any sign of movement. At last, as the sun dipped low in the sky, he saw her walking resolutely through knee-deep snow. He dropped to the ground on a bare patch of rock and shed his scales for human flesh. He stood, staff in hand, and waited. Her progress was slow, but she saw him and turned to meet him. She looked different. He supposed he did too. Her eyes pulsed with power. This Narset had touched something the other Narset had only glimpsed. She stopped a few yards away from him, but said nothing. "Narset!" he said. "You're alive!" She looked him up and down, her eyes eventually settling on his face. She blinked. "I don't know you," she said, looking away. "Do I?" "I am Sarkhan," he said. "You are the sar-khan?" she said, eyes narrowing. "Or do you claim his mantle?" "You've heard of me?" asked Sarkhan. He laughed. "That's wonderful! On all Tarkir, you are the only one who knows me. But how?" She moved to walk around him. "I need to find Ugin," she said, shaking her head. "He is in the canyon," said Sarkhan, "though I fear you'll find he has more questions than answers. Narset, how do you know me?" "You're not…some enforcer for the dragonlord, here to punish my heresy?" "I am no one's servant," said Sarkhan. "I am your friend—or was, and hope to be again." "My friend," said Narset. "Yet I've never met you. How is that possible?" Sarkhan weighed his options…and decided on the truth, no matter that it sounded more implausible than any lie he might concoct. 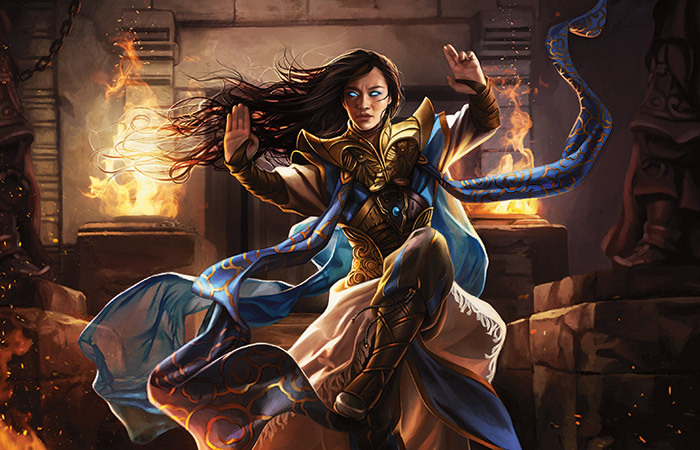 "The Narset I knew was from Tarkir, but not this Tarkir. A Tarkir without dragons—of khans, and clans. My home. She died so I could travel to the past…and rewrite history. She died so that Ugin—and you—could live. She was my friend." "Then the histories are true," said Narset. Her eyes flicked back and forth, as though reading. "Secret histories," she said. "About a dragon-man, a sar-khan, who came from something called the Unwritten—a spiritual vision of the future that an ancient clan called the Temur wrote about. They say the sar-khan raved about a world with no dragons. He saved Ugin, then vanished back into the Unwritten. I didn't credit the story, not in its details. But…it's true, then? The Unwritten, the khans, all of it?" "I don't know what you've read," said Sarkhan, smiling. "But everything you just said is true. Even the raving, I suppose." "That is how I know you," said Narset. "But you do not truly know me, do you? You know…some Unwritten Narset. A phantom." "I suppose not," said Sarkhan. "Yes. I knew Narset. But I do not know you." Narset frowned, as though searching for words. "We might have been, given time," said Sarkhan. "But she is twice gone, now—dead and never born. You are here, now. But where were you? I looked for you among the Ojutai. The man I spoke to called you a heretic, told me you were 'gone.' Was it exile he spoke of?" "No," she said. "Something…far greater. 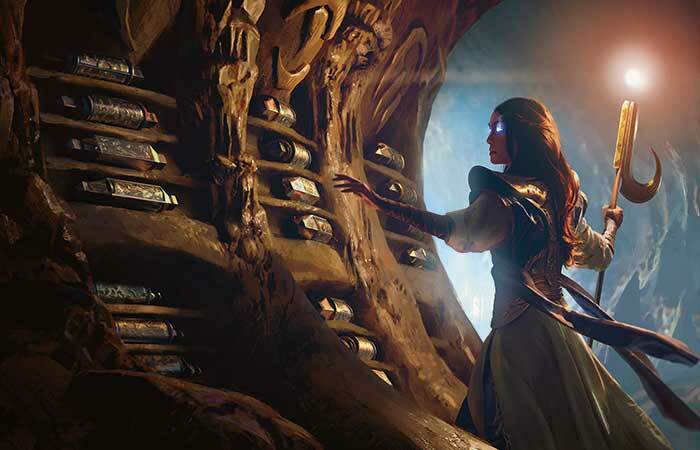 It will sound mad, but I traveled beyond Tarkir, written or Unwritten, to…"
"…to another world?" said Sarkhan. "Planeswalker," said Sarkhan. "That's what we're called. There are very few of us. But between you, me, and Ugin, there are three in this valley right now." "Ugin," said Narset. "I need to speak to him." She began to walk again, away from him, through the snow. "Perhaps you should," said Sarkhan. "I hope he has more answers for you than he did for me. And after that?" "To Atarka lands," said Narset, still walking. "Rumor has it they have ancient stories, carved in mammoth ivory, that go all the way back to the Khanfall." "You're not planning to leave Tarkir again?" asked Sarkhan. "There are multitudes of worlds to explore, and you cannot have seen them all." "Someday I will," said Narset, looking back over her shoulder. "But this world has secrets enough. For right now…I'm right where I want to be." Sarkhan smiled and looked out over the tundra. In the distance, dragons soared.